The JLA is the single most powerful group of siper-heroes ever to be assembled and they’re dropping like flies! Batman’s secret flies on the Justice League have fallen into the hands of one of his oldest and deadliest foes __ Ra’s al Ghul! Now, Superman, Wonder Women, Aquaman, Martian Manhunter, Green Latern, Plastic Man and the Flash are being led into trans specifically engineered to counteract their remarkable abilities. The JLA faces its greatest challenge – possible treason within their own ranks! Will the JLA survive? And if they do, can Batman’s hand in their betrayal ever be forgiven? The answers lie inside. – From the back cover. “JLA: Tower of Babel” is not only a entertaining graphic novel but adds an deeper level to of DC Comics major characters. Most significant in this is the level of paranoid Batman has for his compatriot in the Justice League of America. This is a complete story that a every fan of comics. Fans of Batman, as he the hero/villain of this book, will especially appreciate it. I didn’t get the big picture until middle ways through but it was an interesting journey. It showed that even the most powerful superheroes in the DC Universe could be defeated. It is interesting how JLA Members weaknesses were exploited. There weaknesses are simply character flaws of each hero and that’s why a fan will love the story told. “JLA: Tower of Babel” is a masterpiece brought to us by several writers and artist. The repercussion from what happens in this book can be felt through out the DC Universe. This will show readers just how Batman is the most human, yet psychological flaw character in comic book history. As a reader of the DCU I will never look at Batman the same again. I personally applauded Batman’s action and admonish the JLA for their stance on the situation. In a post ‘9/11’ climate I think we want our hero’s to take a stronger stance against villains and be prepare for a worst case scenario. If you don’t like “JLA: Tower of Babel” then you don’t like character development. This story is full of character development and a changing of the guard. After this each character had to reevaluate his or her situation. They had to take a personal inventory gut check and I think each character was better for it. “The Best of Spider-Man, Volume 1” includes the ‘Coming Home’ storyline (Amazing Spider-Man Volume 2 #30-35), the award winning Amazing Spider-Man #36, a Kingpin Story, Flowers for Rhino Story and Ultimate Marvel Team-Up featuring Punisher, Daredevil and Spider-Man. It’s a nice collection of story through Spider-Man’s lengthy history but I felt for a first volume there were better stories to be told. The first half featuring Amazing Spider-Man Volume #30-36 are an amazing read and gives major insight to Spider-Man, his motivation, and an interesting look at his powers and his enemies. For fans of the character I think they will find this section very interesting and the shocking revelation at the end is worth a read for those uninformed of historical event. The third arc of this graphic novel included was a story from the Marvel Ultimate Universe featuring Punisher, Daredevil, and Spider-Man. It was more of a Punisher story featuring Daredevil and Spider-Man. The Punisher breaks out of jail to avenge the deaths of his family and runs into Daredevil, who’s client he kills, and Spider-Man bumbles into the story by helping the bad guy get away. The editors and my definitions for best of Spider-Man is different. Being “The Best of Spider-Man” means spider-man is at the first and not a background character. Overall its an interesting read and will appeal to a casual reader. Givers the readers a great glimpse into the world of Spider-Man nad the complicated machinations that he must deal with throughout his life. He is the first, and greatest, Super-hero of all time! And now, ten of the best Superman stories ever told – some reprinted here for the first time – are assembled in this must-have collection for all fans of the Man of Steel. Read the comics stories that have defined the legend of Superman for millions of readers! Featuring an introduction by comics historian and movie producer Michael Usian (Batman movies, Catwoman). I personal found that most of the stories were outdated and hokey. The only story that captured any interest was the final story in the book, “What’s So Funny About Truth, Justice & the American Way”. This was the only story that I felt was anywhere near a great story. The others in this compilation just reprinted marginally interesting stories from Superman’s past. “Three Supermen from Krypton”, “The Last Days of Superman” and “The Showdown between Luthor and Superman”, were stories that may have been interesting in there day but have been replaced by more modern and engaging stories. “Three Supermen from Krypton” written by William Woolfolk, published in July and August of 1950 was rewritten and repackaged as “Superman II: The Movie”. “Superman II” is the story that 99% of every Superman fan knows. “The Last Days of Superman” written by Edmond Hamilton, published in October 1962 was done better in the “The Death and Return of Superman” in 1992-3. The later story arc had a more dramatic and impact on the mythos of Superman, making the ‘Last Days’ a far inferior story. “The Showdown between Luthor and Superman” written in October of 1963 by Edmond Hamilton was just pure absurdity. It made Superman in my eyes more of a punk that a hero. It made Superman seem that he was nothing without his powers and that without his powers he can only beat Luthor with luck, and Luthor could still get the best of Superman. “What’s so funny about Truth, Justice & the American Way” by Joe Kelly published in 2001 showed another side of Superman. It showed that Superman wasn’t truly a boy scout. That push comes to shove Superman can truly do what it takes to defeat his enemies. It also showed that at most times Superman is not giving his all to a fight to preserve life and that he can get gritty with opponents. Overall “Superman: The Greatest Stories Ever Told.” is just a marketing title to this compilation of past Superman stories. Over the past 70 years of Superman I’m sure there are more interesting stories from Superman history that are far greater. This is a compilation only the truest of Superman’s fans will like. I can say that not being a die-hard fan; that when I think of ‘the greatest stories ever told’ about Superman none of these even pop into my head. Released in June of 2002, ‘Essential Spider-Man Volume 1’ contains Amazing Fantasy #15, the comic that started it all, Amazing Spider-Man #1-20, and Annual #1. These are the first 22 chapters reprinted from the original comics written by Stan Lee. These are the stories that started the legend and cultural phenomenon. All the stories are from the sixties and it’s full of the vernacular of the time. At time the language is so ridiculous that I would be distracted by it, but that’s the way they talked I guess. The black and white reprint drawings are a hard thing to get use to when you’ve grown up with color filled comics. But I’m guessing its that editor are play on nostalgic, taking the reader back in time to the beginnings of this super-hero, Spider-Man. Although this is the history of Spider-Man, the language, drawings, the stories combine to be hokey. Written for children they really don’t stand the test of time. But will appeal to the die-hard fan of the character. The one thing that it does that makes it worthy of reading is that it a reprint of the original comic that showcase the introduce of some of Spider-Mans rogue gallery: Doc Ock, Vulture, The Sandman, The Lizard, and Mysterio just to name a few. It also features some team ups with the Fantastic Four. ‘Essential Spider-Man’ also showcases the writing of Stan Lee and illustration by Steve Ditko. Lee portrayed peter and Spider-Man in the more classical dual personality, having Peter be ridiculed and rejected by his peers and being an introvert and where Spider-Man it confident and an extrovert. If you’re a fan of the character and never got to read the original start of the comic that is Spider-Man its here in all its glory. If you can get passed the outdated language and the black and white, I think you will find that this is a great graphic novel to read. You get to see the humble beginnings of a cultural phenomenon that even today is influencing children and adult. It shows the creative writing of Stan Lee, who in his own write has influence countless readers. Alone. Throughout his life, Peter Parker has often felt alone. When he first discovered his spider-like abilities after being bitten by a radioactive spider, he kept them secret. His attempts to exploit them for profit resulted in his Uncle Ben’s murder. Later, his attempts at maintaining the secret from his first love, Gwen Stacy, resulted in her death. It seemed as though no one understood the difficult balance between mortal and hero. Until now, that is. A mysterious figure appears suddenly. Exhibiting similar powers to Peter. He can stick to walls and jump from building to building, just like the wall-crawler. Who is this mystery man? Who are the people he represents? And what is the ancient evil that has arrived in America in Search of Peter? “Coming Home” is an interesting story telling Peter of the origin of the power he “inherited” from the spider. Peter meets Ezekiel and with this meeting makes him redefine the concepts that he formulated about his powers. On the heels of this meeting Spider-Man must now content with an evil bent on his destruction, which never tires, and just keeps coming. Even with all of that it’s the ending of this graphic novel that makes it interesting to me, Aunt May’s discovery of Peter being Spider-Man. This marks the beginning of J. Michael Straczynski writing run on “The Amazing Spider-Man” and he starts off with a bang. Right out of the gate he gives Peter a life changing moment. Making him to question the nature of his powers. He gives a well-established conception a new twist readers will find intriguing. It’s a great start to what could potentially be some of the best storytelling in Spider-Man history. “Coming Home” is creatively drawn. Displaying some of the more poignant and distinctive moments to highlight the action to be portrayed. The coloring is vibrant and full of action, standing out even in the night sequence. John Romita Jr. accentuated the writing from Straczynski. “Superman: Birthright” by Mark Waid. “Superman: Birthright” is a twelve-issue comic book limited series published by DC Comics in 2003 – 2004, written by Mark Waid and drawn by Leinil Francis Yu. The series revises the origin of Superman as well as the current Superman/Lex Luthor relationship. It returns to accepted DC continuity some of the history established before DC’s 1985 Crisis on Infinite Earths event and subsequent retcon by John Byrne, including an emphasis on alien heritage over human upbringing, and also introduces elements of the Smallville television series and Superman movies. This series and Superman: The Man of Steel are both accepted by DC as the “official” canon for Superman in modern continuity, although lingering controversy remains over the many conflicting origins of both Superman and Luthor. An intentional ‘synergisation’ of the traditional “scientist” Luthor and the sleeker “businessman” Luthor seeks to reconcile at least some of these differences. The story mostly follows Superman’s early years, including meeting Lois Lane and his first encounter with Lex Luthor in Metropolis. In the series, Luthor uses kryptonite and advanced technology to discover the history of Krypton, and then uses that knowledge to fake a Kryptonian invasion and thereby discredit Superman. “Superman: Birthright” is interesting in how it blended established history and modern mediums. The “reinterpretation” of Superman origins gives way to a more human Clark Kent/Superman by reflecting his desire to help mankind yet having to be above us without losing the humanity in him. It also chose to answer questions that plagued some of the other medium that have become part of pop culture history. In the graphic novel Clark Kent travels the world trying to find his place in the world and interview world changers of the world but his most profound encounter is with an African freedom fighter. As he is interviewing him and traveling with him, he befriends him. In an unsuccessful assassination attempt by an African warlord, Clark’s secret is discover, and their views of him becomes fearful. It showed how this encounter affected Clark and one of the reasons for him taking the Superman persona. It gave one answer a question that cropped in the Smallville universe of if Clark and Lex were friends how do they become complete and total nemesis. Although the path that Smallville is taking is interesting. The way Waid wrote it “Birthright” gave it another level of complexity. Although there is controversy reading I felt that it was interesting and worth the time to read. It gave a modern flare to 70+ years of mythos that Superman’s origin has. 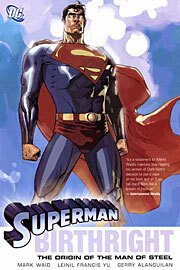 It made the icon of Superman more accessible to new generation of comic book readers. It also shows respect to those readers that have been with him for decades. Six years after the Battle of Endor, The Empire has been reborn –guided by a mysterious new leader, and possessed of a weapon more terrifying than the Death Stars. Princess Leia and her husband Han Solo struggle to hold the fledgling New republic together, even as they fight to protect their unborn child from the bounty hunters and imperial troops who dog their steps, but their greatest danger my lie in the troubled heart of a hero – as Luke Skywalker succumbs to the lure of the dark side! I as many want the final three episodes. I found this on the shelf of my public library. Published by Dark Horse comics I don’t know if its George Lucas canon but its holds an interesting tale told between its covers. It expanded the universe and continued the struggles our heroes have even after the downfall of the emperor. It showed Leia as having recognized her connection to the force and showing signs of Luke’s tutelage. “Dark Empire I” held that same fast pace, swashbuckling adventure that Episodes 4-6 had. The dialogue and draw brought you back into a familiar world. If you’re familiar with the movies then you can instantly jump into this story.Remembering the journey Luke took in “Return of the Jedi” its interesting to see the return of an old foe, and his tempting embrace the dark side. What was most surprising for me was Leia abilities with the force. The way she started to embrace the force and how strong her connection to her brother was. Seeing her weld a lightsaber was especially satisfying. It’s been bound into three volumes. This is only Volume one it only has the first six comics of the series. I have not been able to get my hands on Dark Empire 2 or Empire’s End. This was a third edition published in 2003. If anyone out there knows where I could get a hold of the final two volumes of the Empire trilogy, I would greatly appreciate it.